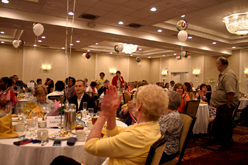 NAMI NJ celebrated its 30 years of improving the lives of individuals and families affected by mental illness on Saturday, June 13, 2015 at its Annual Meeting and Awards Luncheon at Crowne Plaza Monroe. Over 200 NAMI NJ friends and supporters attended and enjoyed the heartening camaraderie of the classy celebration. Among the groups of people who were recognized at the event for having made tremendous contributions to NAMI NJ’s sustainable success are NAMI NJ’s five founding members, Eileen Griffith, Marilyn Goldstein, Elena Stolzer, Lucille Klein and Joyce McKee; founding partner and former DMHAS Affiliate Liaison, Bonnie Schorske; Staff Longevity Recognition Awardee Celina Sanchez; 17 Present and 93 Past NAMI NJ Board of Trustees; 91 founding, long term and new affiliate leaders; the Von Lindern Family who received the first Ed Von Lindern, Jr. Advocacy Award; Stephanie Har receiving the first Dara Axelrod Expressive Arts Network Award; Top Ten winners of the 2015 Dara Axelrod Expressive Arts Mental Health Poetry Contest; Greg Muller and John Gesumaria of NAMI Union who received the Law Enforcement Education Awards; Consumer Council Rep. Bill Butler; Melody Dutch and Elena Kravitz receiving In Our Own Voice & NAMI Connection Recognition; NAMIWalks NJ 2015 top 10 fundraisers and teams, walk volunteer awardees NAMI Ocean County, Sudhir Jain, Emma Thompson and Allison Riccardelli; and NAMI NJ key partner organizations New Jersey State Federation of Women’s Clubs, First Baptist Church of Lincoln Gardens, Hidden Gems, New Jersey Psychiatric Association and Alpha Kappa Alpha Sorority. Together, we look forward to many more years of proving support, education and advocacy and furthering our mission of improving the lives of those affected by mental illness and their families!